What Does Code P2647 Mean? When an OBD-II equipped vehicle has stored a code P02647, it means that the powertrain control module (PCM) has detected a valve train (rocker arm) malfunction for engine bank one. Bank 1 denotes that the problem has occurred in the bank of the engine which contains the number one cylinder. The designation (A) may apply to an individual cylinder intake valve rocker or to all of the intake valve rockers for engine bank one. This code is applicable to vehicles with electronically assisted valve train systems, only. This includes vehicles which electronically manipulate engine oil pressure to assist in valve timing variation. A select number (very rare) of vehicle applications employ an electronic system of opening and closing intake and exhaust valves. In this advanced type of system, conventional camshafts are unnecessary because the PCM controls electronic solenoids (referred to here as actuators) which open and close intake and exhaust valves at the appropriate time. Crankshaft position is constantly monitored by the PCM (with the engine running) by – you guessed it – the crankshaft position sensor. By monitoring the position of the crankshaft, the PCM is able to accurately calculate when to open and close individual valves in order to optimize power output and maximize fuel efficiency. This type of electronically controlled valve train system is beneficial because it eliminates the need for mechanical engine timing components that need to be replaced at regular intervals. It can also be detrimental because of the delicate nature of the electronic components which are required to operate in perfect synchronicity with each other. Typical operation will dictate that a 12-volt signal is applied to all rocker arm solenoids (actuators) with the ignition in the run position. The rocker arm actuator circuit is completed when the PCM applies a ground pulse to the appropriate actuator at the exact interval. The actuator will push up on one end of the rocker arm which is affixed to the cylinder head on a stationary pivot. This motion will result in the front side of the rocker arm being forced downward where it will contact the tip of the valve stem and open it. When the solenoid is de-energized, the actuator will retract and the valve will close. This action is repeated with each stroke of each cylinder of the engine while it is running. 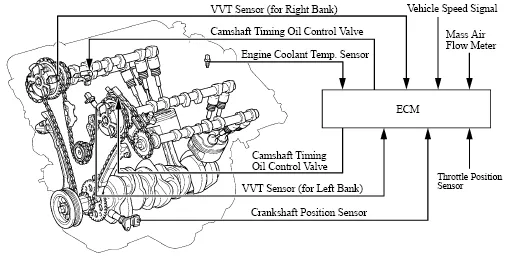 Variable valve timing systems use electronic actuators to manipulate oil pressure. Specially designed passages in the cylinder head allow varied degrees of oil pressure to reach rocker arm actuators, according to RPM level and engine load percentage. In this type of system, hydraulic (oil) pressure controlled actuator/s are used vary the length of time the intake valve/s are opened (duration) and how far (lift). If the PCM detects a level of resistance from the rocker arm actuator circuit indicating that it is stuck in the on (valve open) position, a code P2647 will be stored and a malfunction indicator lamp may be illuminated. What are the common causes of code P2647? What are the symptoms of code P2647? How do you troubleshoot code P2647? Gain access to a diagnostic scanner, a digital volt/ohmmeter (DVOM), and a reliable vehicle information source (AllData DIY) before attempting to diagnose a code P2647. A manual oil pressure gauge may also come in handy. Make sure that the engine is filled to the proper level with the recommended oil and that the engine is in good working order. If you have doubts about the integrity of the engine lubrication system, make use of the manual oil pressure gauge and compare your findings with manufacturer’s specifications. Low engine oil level and low engine oil pressure are the leading causes of variable valve timing codes being stored. Search technical service bulletins (TSB) for entries that match symptoms and stored codes for the vehicle in question. If you can locate such a TSB, it will likely put you on the road to a successful diagnosis. 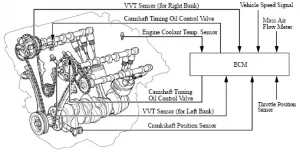 Perform a careful visual inspection of all wiring and connectors related to the rocker arm actuators and VVT/VTEC sensors and actuators before beginning your diagnosis. Repair or replace open or shorted circuits and/or connectors as required. Connect the scanner to the vehicle diagnostic port. Retrieve all stored codes and freeze frame data then write it all down. It may be helpful, particularly if the code P02647 proves to be intermittent. Now, clear the codes and test-drive the vehicle to see if it is reset. Use the DVOM to test the rocker arm actuator or VVT/VTEC sensors in question according to manufacturer specifications. Replace defective components as required. Should it become necessary to test individual circuit resistance and continuity (with the DVOM), be sure to disconnect all related controllers from the circuit to prevent damage. If all actuators, sensors, and circuitry are in order, suspect a defective PCM.